Firefighters are scaling back their work after a major fire in Lewes earlier today (Tuesday). Fire crews were sent to the scene in Upper Stoneham at around 10.25am. 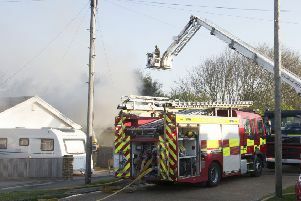 At the fire’s height, East Sussex Fire and Rescue Service say, six appliances from Lewes, Barcombe, Brighton, Newhaven, Uckfield and Heathfield were at the scene. Earlier today firefighters wearing breathing apparatus used two hose reels and two main jets to tackle the fire. Two appliances remain at the scene to damp down the fire and ensure the situation is under control. No casualties have been reported and a fire investigation officer has been called to the scene.